Here I am again with 2 posts in 1 day, but I have been getting alot of cards made in the last few days so I thought I would add them to my blog. The backgrounds are all made using Tim Holtz distress inks except for the one with the butterfly which is done with his alcohol inks. I just love the effects you can get with these inks & I love the colours that they come in. 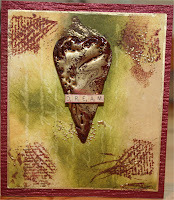 The heart is made with Opals embossing powders, the "For You" title was cut on my PI & I have used some of my HUGE stash of stamps on the backgrounds (including my new script stamp again). 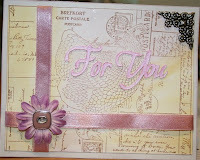 What fantastic cards, I particularly like the For You card. Gorgeous card, love the colours. What beautiful cards I love the For Yoou card so pretty. Girlfriend.....YOU have been busy. Great cards and I also would like to know if you cut the butterfly on your PI and if so where did you find a file for it??? Hi Pam, no, that particular butterfly is actually a metal embellishment, although I think I do have a couple of butterfly files if you want one. Love these cards - just my style, and great colours.